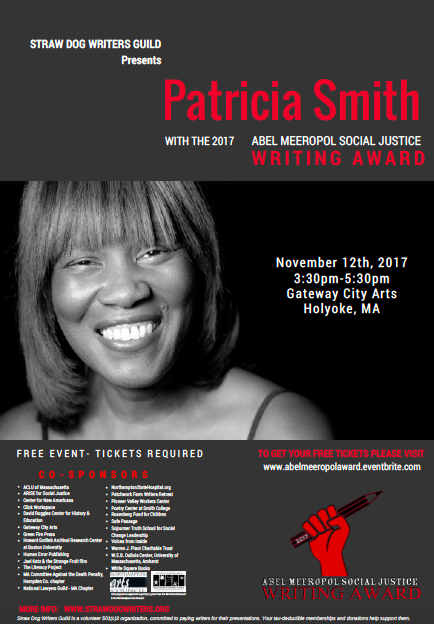 Straw Dog Writers Guild will present the Abel Meeropol Social Justice Writing Award to poet Patricia Smith . Abel Meeropol (1903-1986) was a progressive Jewish poet, playwright and composer writing under the pen name Lewis Allan. He is best known for his iconic anti-lynching song “Strange Fruit,” made famous by Billie Holiday and named the Best Song of the Century by Time Magazine in 1999. He and his wife Anne adopted the sons of Ethel and Julius Rosenberg, Robert and Michael, after the executions of their parents. Abel moved to Western Massachusetts in 1980. Award recipient Patricia Smith is a Guggenheim fellow, a National Endowment for the Arts recipient, a two-time winner of the Pushcart Prize, and a four-time individual champion of the National Poetry Slam, the most successful poet in the competition’s history. She is the author of eight books of poetry, including Incendiary Art; Shoulda Been Jimi Savannah, winner of the Lenore Marshall Prize from the Academy of American Poets and Blood Dazzler, a National Book Award finalist. At the November 12 award ceremony, local singer/songwriter Pamela Means will perform “Strange Fruit” and Abel’s son Robert Meeropol will present the award. Patricia Smith will read from her work and talk about the ways literature can explore important social issues and bring us together as a community. Co-sponsors – ACLU of Massachusetts, ARISE for Social Justice, Center for New Americans, Click Workspace, David Ruggles Center for History & Education, Gateway City Arts, Green Fire Press, Howard Gotlieb Archival Research Center at Boston University, Human Error Publishing (Great Falls Word Festival), Joel Katz & the Strange Fruit film, The Literacy Project, MA Committee Against the Death Penalty, Hampden Co. chapter, National Lawyers Guild – Massachusetts Chapter, NorthamptonStateHospital.org, Patchwork Farm Writers Retreat, Pioneer Valley Workers Center, Poetry Center at Smith College, Rosenberg Fund for Children, Safe Passage, Sojourner Truth School for Social Change Leadership, Voices from Inside, Warren J. Plaut Charitable Trust, W.E.B. DuBois Center, University of Massachusetts, Amherst, White Square Books. and are supported in part by a grant from the Northampton Arts Council. For more information about the program and tickets (free but required), visit www.strawdogwriters.org/abel-meeropol-award or contact Straw Dog Writers Guild Administrative Director Laura Stone at 413.768.0977 or admin@strawdogwriters.org.